4 shoes traveling the world | Two travelers, a brother & sister. Four shoes. Today we depart France and mark the close of our Summer 2013 family vacation in Europe. I sought to expand their view of this world, of the people on this planet. I sought to give them a glimpse into life outside suburban San Francisco. I sought to show them how others live. I sought to show them history. I sought to make our own history. I sought to show them why this Californian has fallen in love with Paris, in love with traveling. I sought to show them they are the two most important people in my life. then this was a fantastic summer vacation. I missed the fourth of July and all the fireworks since I was at the beach in Corsica. 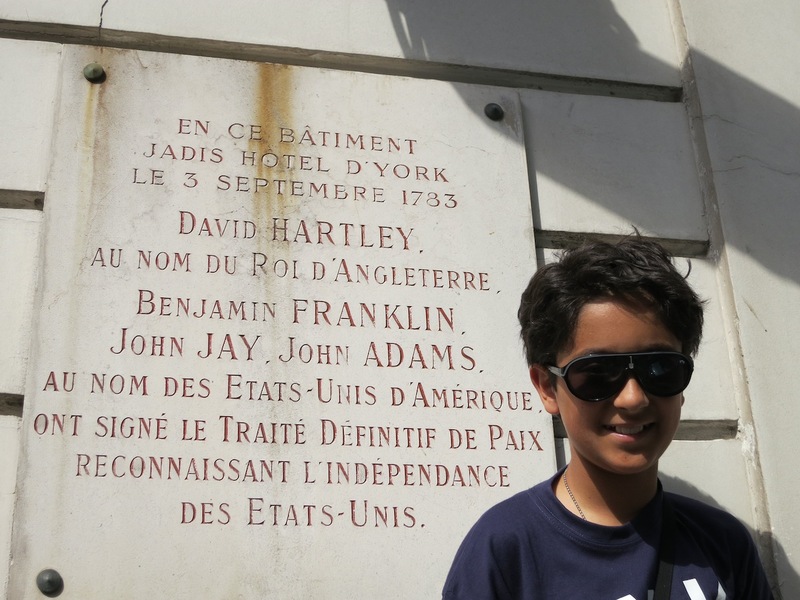 So today my dad took me to 56 Rue Jacob, the spot where the Treaty of Paris was signed in 1783. The Treaty of Paris ended the American Revolutionary War between the United States of America and Great Britian. Here I am standing where Benjamin Franklin and John Adams were 230 years ago!